He adds that productivity has surged in the recent employment downturn – GDP continues to grow, albeit with fewer workers – but income and wages are not keeping up. “If the median household income had kept pace with the economy since 1970, it would now be nearly $92,000, not $50,000.” Corporate executives (whose incomes have managed to keep pace and then some) and their shareholders much appreciate the effort. Chapeau! 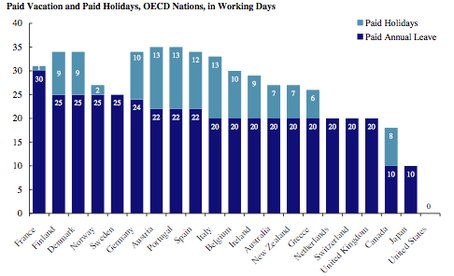 A 2011 report from the University of Washington and Imperial College London revealed that while the world’s leading industrialized countries (including those lazy Brits, French and Germans mentioned above) continue to trend up in life expectancy, 80% of the counties in the US have slipped further behind the average of the globe’s top performers. The CIA now places the US at #51 globally in life expectancy, behind Puerto Rico, Jordan and Guam (in case you are curious). According to the UofW report, life expectancy in many US counties is now about where the leading western world stood in 1957. Consider that there will be about 3 billion more Chinese entering the middle class by 2040; 3 billion more consumers of iPads, automobiles, family homes, and La-Z-Boy recliners. At the current pace of population growth and global consumption we’ll need a second earth of resources in the just 30 years. This unsettling claim I overheard in a meeting at the European Commission in Brussels last week. Okay, so where is the good news? Getting to it. Given that a new planet is unlikely, the existing middle class needs to downshift on our side of the ledger because the new arrivals are definitely upshifting on theirs. Fewer people will help of course, hence the silver lining in the American life expectancy numbers. Someone has to step up and lay down (6 feet down) in a world of dwindling resources, rising temperatures, and ballooning consumption, and once again the US seems to be heeding the call. I am of course being morbid and flippant. The key to accommodating the growing class of global consumers is to curtail our existing consumption compulsion. Couldn’t we all survive with fewer iSomethings, smaller cars (or better yet, go carless), more modest homes, and a pivot to simpler, more meaningful experiences that require quality time, not money and stuff? Can we expect the newly minted middle class in China and elsewhere to live frugally in light of growing concerns over climate and resources, when we ourselves are unwilling to cut back? We’ve mastered the art of working hard, the art of generating wealth, and the art of spending our fortunes big and small on gifts grand and modest to ourselves (our increasingly big selves) and loved ones. Perhaps instead it’s time to learn the art of doing nothing? Funny that you mention it. 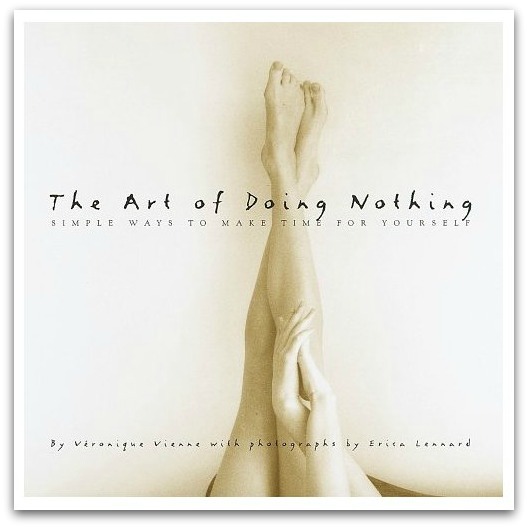 I recently bought The Art of Doing Nothing by Véronique Vienne, first published in 1998. As she writes in the liner notes, this is “a practical guide to rest and relaxation, ….where ‘being’ is more compelling than ‘doing’.” Rather than gives us 7 steps to creating a new business or achieving financial freedom, Vienne gives us the art of procrastinating, lounging, napping (my favorite), listening, and more. None require a penny of investment, none consume an ounce of the earth. Feeling a bit overwhelmed at the moment? I highly recommend it.